19/10/12 - Acquisitions - Agen, Musée des Beaux-Arts - While many museums rarely publish their acquisitions, we would like to point out an exception, the site for Fonds Régional d’Acquisition des Musées (FRAM) in Aquitaine and its database. In it, we found works which joined public collections in the last few years which will be the subject of some of our upcoming articles. We begin here with the Musée des Beaux-Arts in Agen. The last addition we mentioned in an article was a pair of 18th century Neopolitan paintings by Giovanni Battista Lama in 2008. Two other canvases were purchased by this museum in 2010 and 2011. In 2010, the portrait of a lady from the court of Charles II represented as a melancholic shepherdess was acquired from a private collection in Bordeaux with an attribution to Peter Lely’s studio (ill. 1). Although the name of this painter is not in fact correct, his influence is clearly obvious, placing the author of this work among the many Flemish artists active in London following the example of Van Dyck. The pose seen here is frequently found in this type of portrait : the model is cut off at mid-leg, the hand placed on her cheek, and is seated in front of a dark landscape in contrast to the brilliant fabric of her dress. 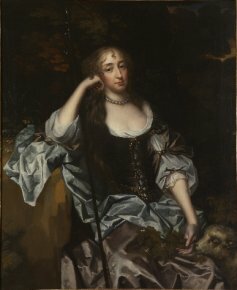 The young woman represented might be Barbara Villiers, Duchess of Cleveland, the king’s mistress, who is known to have had a strongly prominent nose ; an engraving by William Sherwin shows her in a very similar pose to the one in this painting. Art specialists  do not agree on an attribution and hesitate between two names. This canvas is a work by either Jacob Huysmans, a painter born in Antwerp, active at the court of Charles II of England, often mistaken with Lely, or else by Gilbert Soest, a native of the Netherlands who spent his career in London. It joins the portrait of Hortense Mancini at the museum in Agen, painted by Ferdinand Voet, Duchess of Mazarin, also a mistress of Charles II. 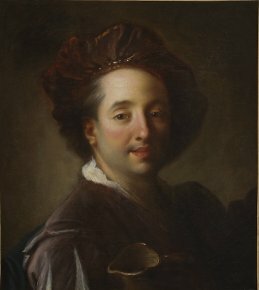 Portrait of a Drinker, c. 1720-1730 ? We go from a shepherdess to a drinker with an imaginary portrait by Alexis Grimou (ill. 2) acquired in 2011 on the art market in Bordeaux (Galerie L’Horizon Chimérique). This type of figure is a recurrent phenomenon in the artist’s work and might well correspond to a self-portrait. Like Rembrandt, whose chiaroscuro style definitely influenced him, Grimou enjoyed representing himself. In fact, there are several known figures, mid-height, men or women from the lower classes painted in trivial scenes from everyday life, inspired by both 17th century Dutch or Caraveggesque art. For example, we point out a painting at the Musée Fragonard exhibited recently and also a Self-Portrait as a Drinker at the Louvre. Guillaume Faroult, Karen Hearn and Catharine MacLeod were consulted by the museum.